I decided to make a separate post on the resources for vacuum chucking. One example of an inexpensive HVAC type pump – this pump will generate an oil mist. A vacuum generator that runs off compressed air – not discussed at the meeting (available from Woodcraft). Holdfast Vacuum adapter available through Woodcraft. This adapter has a rod that passes through the headstock, but it turns at the same speed as the headstock. Goop glue is one example of a heavy non-hardening adhesive to bond a PVC fitting to the wood backing plate. NOTE: in general terms, for sealing, thinner is better than thicker. Thicker materials like mouse pads and the thicker router non-slip pas, can allow the bowl to move on the chuck. However, thicker materials are useful for using the cup chuck to hold the workpiece after it has warped as a result of the drying process. Craft Foam (Used as vacuum chuck gaskets and donut chuck padding) – Many places, including local crafts store, Walmart and others. Some comes with a sticky side (peel-off) which can be handy for applying to chucks. Router non-slip pad (as demonstrated) – don’t get the perforated mesh type – I’m not sure the solid type is still available. 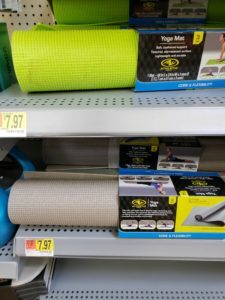 Exercise Mat – I believe this what Bob demoed the other night. I picked up a roll of this in Walmart yesterday for just under $8. This is 3 MM thick (~1/8 inch) which is about optimum for thickness. These are used to center the workpiece on the vacuum chuck by leaving it in the chuck, unthreading the chuck off the spindle, and then inserting the adapter in the tailstock. Then, the workpiece can be brought up to the vacuum chuck and it will be perfectly centered.